Capacity management is the discipline that ensures that IT infrastructure is provided at the right time in the right volume at the right price. IBM® Tivoli® Performance Analyzer is a strategic capacity management solution from IBM that adds value to IBM Tivoli Monitoring, IBM Tivoli Service Management, and OMEGAMON® products. 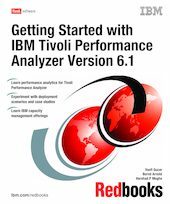 This IBM Redbooks® publication provides a practical guide to implementing, using, and optimizing IBM Tivoli Performance Analyzer Version 6.1, which includes planning and deployment scenarios, troubleshooting, and so forth. We position IBM Tivoli Performance Analyzer against two other IBM capacity management solutions, IBM Tivoli Capacity Process Manager and HyPerformix IPS Capacity Manager. We also provide some best practice guidelines on when to use each solution. To better explain the product functionality, we included several case studies that will help you understand the capabilities of IBM Tivoli Performance Analyzer. This book is a reference for IT professionals who implement and use IBM Tivoli Performance Analyzer in small, medium, and large-scale environments.